Analytics maturity in India climbs new rungs of opportunity, as it gets tied to cricket, beauty pageants and news distribution. Personalisation knocks on your living room with customised ads on your TV set and tailor-made news in your local language on your smart phone. The year 2014 witnessed phenomenal maturity of the Indian Analytics industry. We have seen all our predictions for 2014 come true and they crossover to 2015. As we continue to trace the Indian analytics trajectory, here is the list of Top 11 Analytics Predictions for 2015. As 2014 year draws to an end, we decided to draw up one of those typical end-of-the-year lists we are all so fond of. This is a list of the most searched-for Analytics companies. 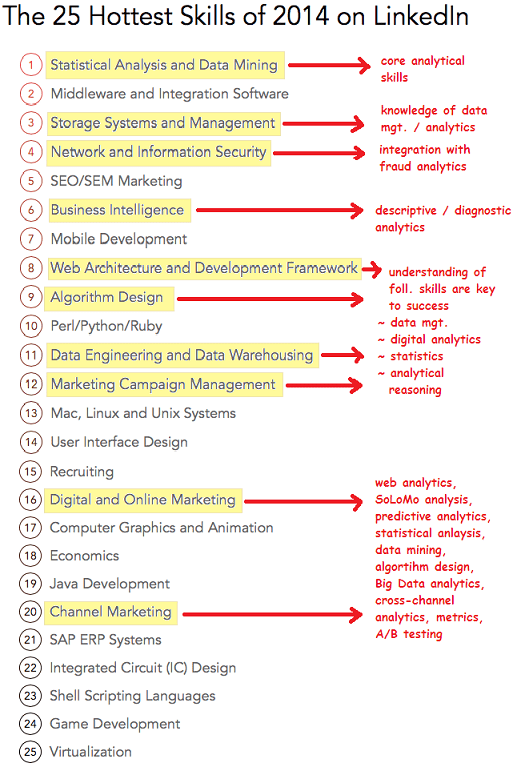 Breaking News: Analytics related skills among LinkedIn ’25 Hottest Skills in Demand’! The focus this month has been more on new applications and solutions rather than acquisitions. Special mention of the new all new app Surveyi2i, a great blessing to all who need to translate surveys into insights on-the-fly.